At last, a triple-purpose thread for the multi-layered beast that is the Whoniverse, and all its future excitement in 2011 and beyond. Talk about new Who, classic Who, the spinoffs, the merchandise, the stars, the parodies... whatever you want, as long as its Who! So what will 2011 bring us in the way of new Who to savour? When: Divided into two halves this year, the first six episodes will air in the Spring, and the final seven in the Autumn. Starring: Matt Smith, Karen Gillan & Arthur Darvill with Alex Kingston. What: The return of Captain Jack Harkness alongside Gwen & Rhys Williams. It's set mostly in America and is a co-production with US network Starz. One of the new writers, John Shiban, wrote a LOT of classic X-Files episodes... so this could be better than the mess that was Children Of Earth. Starring: John Barrowman, Eve Myles, Kai Owen, Tom Price, Mekhi Phifer, Arelen Tur & Bill Pullman. Writers: Russell T Davies, John Shiban, Doris Egan, Jane Espenson and John Fay. What: The continuing adventures of Sarah Jane Smith, former companion to The Doctor, alongside her friends Clyde & Rani, and her adopted alien-clone son Luke. K-9 may also make further appearances. The first half of the season was filmed alongside series four, with the rest happening later this year - most likely alongside a sixth series. Starring: Elisabeth Sladen, Daniel Anthony, Anjil Mohindra, Tommy Knight, Alexander Armstrong & John Leeson. Writers: Phil Ford & Gareth Roberts. More tbc. What about the unofficial K9 spin-off? Elessar wrote: What about the unofficial K9 spin-off? In all honesty, that thing looks ruddy dreadful. It makes "K-9 And Company" look classy. Speaking of which, David Walliams presented a night of 'so-bad-its-good' telly clips tonight on Channel 4. As well as featuring THAT title sequence, they also featured a top five bad effects in Doctor Who list. Mostly from Tom Baker's era, tbf... bubble wrap mutated hands, tin-foil aliens and the giant blob with a knob that was Erato. 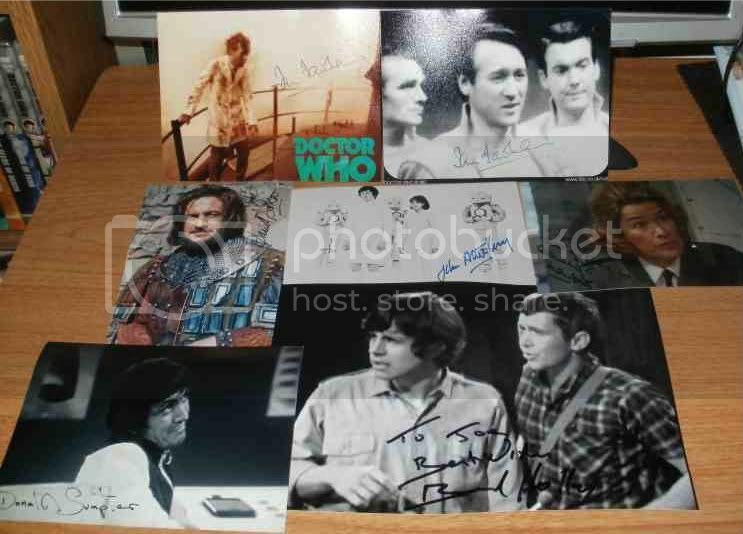 Since last October I have been doing a big push to obtain TTM as many classic Who autographs as I can, with the odd new Who sigs thrown in every now and then. Heres just a taster of what that nice postman has delivered. Plus loads more, some of whom I'm in regular contact with via e-mail. That's pretty awesome! 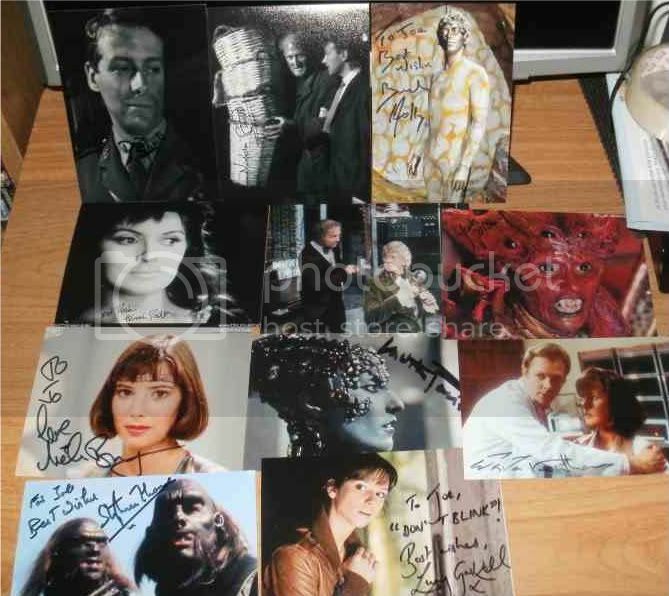 We've discussed autographs before, with some people not seeing the point of them, but when you've got a huge collection of signed photographs like that, I really do see the point. That's a wonderful collection. Cheers mate. I'm not being selective and only chasing the 'big names' like Kylie or Michael Gambon for example. I'm going for mostly supporting cast members and the odd monster actor or two. *= the only one who refused to sign what I sent him. Busy, busy...keeps me off here anyway. Last edited by Champs on Sun Dec 04, 2011 12:16 pm, edited 2 times in total. That's pretty cool actually. I've only got three Who signatures, but they're all collected in person. Frazer Hines happened to be signing his book opposite the store I work part-time in around my degree, so I went to talk to him and he was utterly lovely. 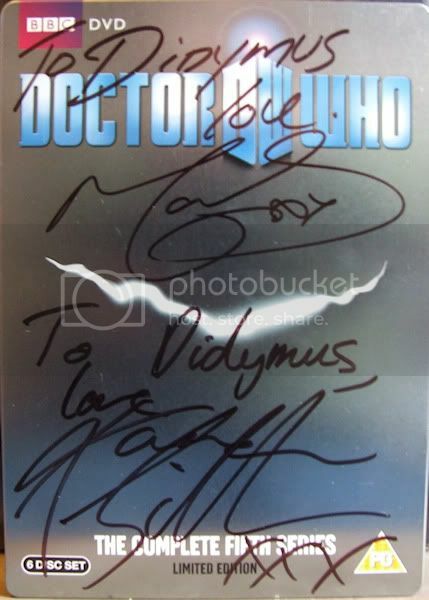 And a few weeks back I chanced my way into the dvd signing for Season Five, and got to briefly talk to Matt & Karen. However, a few years ago I won a competition to win a signed copy of 2 Hearts, with a piece of confetti from the video hand picked by Astrid herself... so does that count? Very nice, Dids. I'd love to meet Frazer one day. Champs wrote: Very nice, Dids. I'd love to meet Frazer one day. He was meant to be doing his one-man show in Manchester late last year but poor ticket sales forced him to cancel, sadly. Sounds like its a real hoot as well. I've decided to offer up a few thoughts on each era and what works/doesn't... all imho. By all means dissect my opinions... agree/disagree/debate - whatever. Let's look at each era in turn, and see where it takes us. If this works out, we can maybe do one a week, which should take us up to the return of the show around Eastertime. Starring William Hartnell with William Russell, Jacqueline Hill, Carole Ann Ford, Peter Purves, Maureen O'Brien, Adrienne Hill, Jean Marsh, Jackie Lane, Anneke Wills, Michael Craze, Peter Butterworth & Nicholas Courtney. If you show a fan of the new series an episode starring William Hartnell, they'll be hard pushed to recognise the character he plays as the same one as Tennant, Smith & Eccleston. The roots of the series were far removed from what we have today, but somehow it still draws you in. 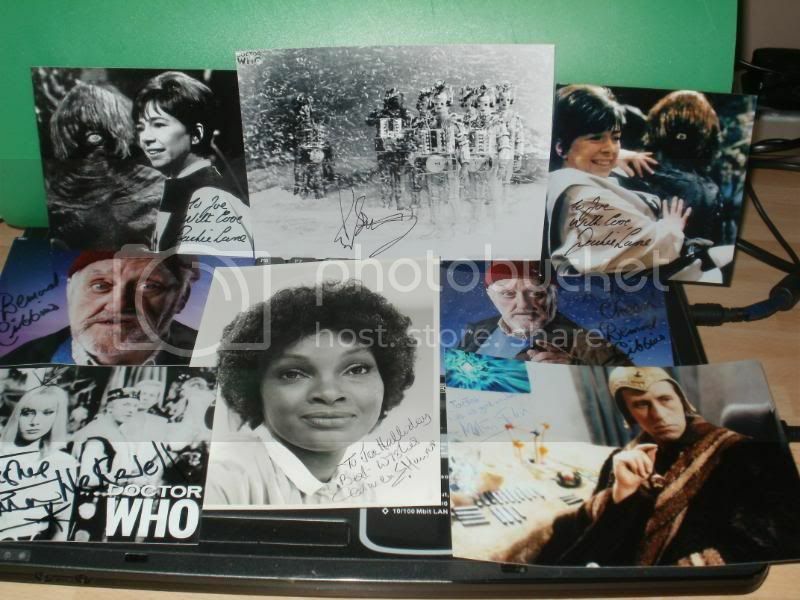 I think this is primarily down not to Hartnell, who is unique and alien in all the right ways, but to his two main companions, Jacqueline Hill as Barbara Wright and William Russell as Ian Chesterton. Both have a warmth to them that helps them rank as some of the finest regular characters in the series to date, with Russell's Ken-Barlow-In-Space schtick bouncing off the cool but caring Barbara brilliantly. Sadly, most of the Doctor's other companions in this era are forgettable filler - teenage girls with not much to do but get into trouble and be rescued. Of these, its the original, Susan Foreman (Carole Ann Ford) who comes off the best - despite only vague references to her mysterious background. Sure, she falls over and hurts her ankle/leg/arm/whatever a little too often, but she has an alien look about her that reminds you of her unusual origins. We still don't actually know if she WAS his granddaughter, which is a fun little mystery to throw into the mix. The only other companion of note really is Steven Taylor, played by future Blue Peter presenter Peter Purves. I think he comes off particularly well, and is the first sign of a shifting dynamic towards action-hero blokey-blokes in the show which would continue until the mid 70s. Others tend to fade into the background a little - so much so that poor old Dodo actually disappears halfway through a story and no-one really notices! And what stories we have on offer! The early days mixed futuristic worlds with historical adventures, which often had only a minimal scifi twist yet somehow managed to be equally as mesmerising, if not more so. This era was of course, spearheaded by the Daleks, whom the nation took to their hearts alarmingly quickly. Other memorable villains had more human faces... the mysterious Celestial Toymaker, played by the legendary Michael Gough... or the mischievous Meddling Monk, who was one of the Doctor's own, then untapped race. Over time, the storytelling shifted from the morality tales of early episodes towards a more action-orientated adventure show. The first story properly set on present-day Earth occured at the end of the third season, and just three stories before Hartnell was forced to retire from the role due to increasingly poor health and the needs of a new producer to refresh the series. Hartnell would only return to the series once, briefly, in the tenth anniversary celebratory story "The Three Doctors", before passing away in 1975. He left behind a powerful legacy... all these years later, the show continue to thrive and he himself was glimpsed three times in the latest series. The show may never have been a success without him. The Hartnell era was mainly know for it's historical stories - which was the shows brief at first - to be both educational and fictional in order to gain an audience. The whole sci-fi element simply crept in, which of course injected new life into a show that was commissioned to last under 10 weeks. At the time of obtaining the lead role, William Hartnell was in his 50's and roles were starting to wear a bit thin for him. Known for heavy military types in movies and TV shows, the role of 'Doctor Who' was further than just about everything he had done at that point. A role he made his own; irascible yet sincere. An old school performer who utilized facial acting rather than more grander gestures. A role he understandably was unwilling to give up, but illness forced his hand as he was more and more fluffing lines etc, sometimes not appearing in a full episode...due to whatever the reason was at that time. Carole Ann Ford played 'Susan Foreman', who spoke of being his granddaughter who were both exiles of the fourth dimension. Unworldly appearance with the only hint of character development was in the story 'The Sensorites', in which she utilized ESP powers. Sadly this aspect of Susan wasn't used again and the actress became disheartened of the role and was the first of the original crew to leave. The Daleks appeared in the second story and returned to face the first Doctor a further three times. Twice this Doctor was aged further on screen - thus explaining his weary body in later seasons; first in The Daleks' Masterplan in which a fellow companion aged to death next to him along with the foliage around them. The second time a similar thing happened was in the tale The Savages - in which his life force was drained. Such events were sure to take their toll and early in the fourth season of Doctor Who, without warning, the lead actor collapsed onto the TARDIS floor and in front of his companions...underwent a complete transformation in front of their eyes and the general public's too. Just who was this man that had this ship disguised as a mid 20th century police box? Just who was this chap called 'The Doctor'? What was he and where was he from? More importantly...what was going to happen next week..? 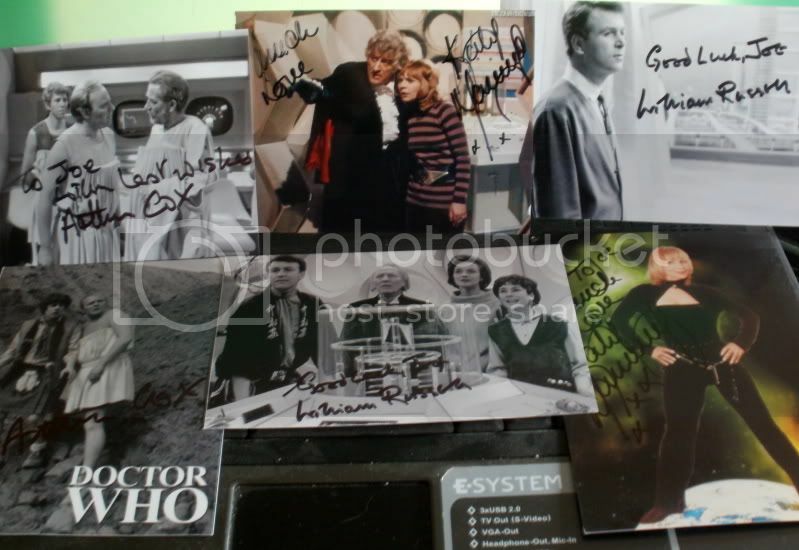 On Saturday the 29th October 1966 the Hartnell era was at a close - just two stories into a new fourth season. Adventures available on DVD inc; The Daleks, The Time Meddler, The Ark, The Romans, The Rescue, The Chase, The Aztecs, An Unearthly Child, The Edge of Destruction, The War Machines, The Dalek Invasion of Earth, The Keys of Marinus, The Space Museum as well as the odd episodes of incomplete tales; The Crusade, The Daleks' Masterplan, The Celestial Toymaker etc featured in the Lost In Time boxed set. Great topic Didy, and that's a pretty damned impressive collection there Champs- I'm officially green with envy. 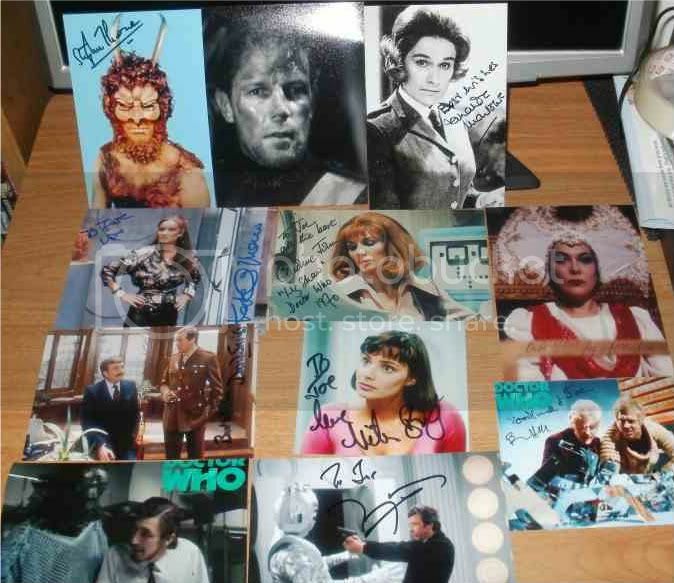 I only have the one signed photo, which is an artwork for The Horns Of Nimon, signed by Tom and Lalla. i like Hartnell's Doctor a hell of a lot, and I'm currently trying to get hold of target novelisations of the Hartnell and Troughton missing stories to plug the gaps until the Beeb either do recons or I get my hands on the soundtrack CDs. Anyone who thinks Billy fluffs his lines and can't act should go see Brighton Rock, which is frankly excellent cinema, or The Yangtse Incident, where he shares screen time with Bernard Cribbins, prior to his time even in the Aaru Dalek films, let alone Nu-Who season 4! The Time Meddler- a wonderful historical romp in which we get to see another Timelord (Although not referred to by that name) for the first time, very capably played by Carry On alumnus Peter Butterworth. The War Machines- A Jon Pertwee styled UNIT story, before UNIT was even thought of, and the sequence where Hartnell stares down the war machine robot is definitive Who- and Michael Craze and Anneke Wills make their debut with honours- and despite footage of them with Hartnell AND Troughton being rare, this was enough to make them my favourite companions of the Hartnell era. The Edge Of Destruction- A wonderful character piece utilising only the Tardis set, and brilliantly played by all the cast. Imagine Midnight being a two-parter and set on the Tardis- and Hartnell gives a wonderful preformance with his speech at the story's climax. The Dead Planet (The Daleks)- The deadly pepperpots have never been so well realised as when they made their televisual debut, cementing Doctor Who in the public conscious for decades to come.